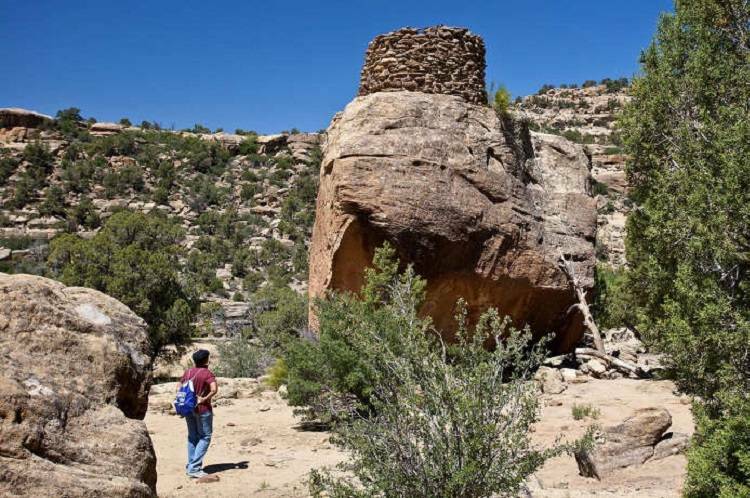 The wildlife, scenery and a Navajo Pueblito found amidst this 3,900 acres of diverse canyon landscape make this a great area for day hikes. ​Simon Canyon is about 3,900 acres in size and is managed for fishing, hiking, and backpacking. The diverse canyon landscape provides habitat for the golden eagle, prairie falcon, great horned owl, porcupine, beaver, and deer. Local sportsmen and fishing enthusiasts from across the United States come to fish the stretch of Quality Waters that flows past the mouth of Simon Canyon. The canyon also contains remnants of an earlier human occupation. Simon Canyon Ruin, a Navajo Pueblito, sits on a bench overlooking the canyon. Location: North of the San Juan River, about 3 miles west of Navajo Reservoir. Simon Canyon is about 30 miles east of Farmington and is generally accessible via US Highways 550 and 64 and State roads 173, 511, and 539. To reach the parking lot, turn north from NM 173 onto County Road 4280. Follow the road about 3 miles from the turnoff to reach the parking lot. It is important to note it may become impassible in bad weather.